Biogas and the benefits it brings to your business. Let us guide you. Which environmental benefits does the product of biogas have? Biogas is a renewable and C02-neutral form of energy. There are no fossil carbon released when burning biogas, which occurs when burning coal, oil and natural gas. Simultaneously methane and nitrous oxide is collected. These are essential greenhouse gasses that occur when manure is spread on the field without being processed in a biogas plant. Therefore production of biogas is the cheapest solution to reducing greenhouse gas emission. Another important factor is that degassed manure has a bigger impact of nitrogen on plants than unprocessed manure. This makes the plant more receptive of nutrients in degassed manure. This results in less nitrogen leaching in the groundwater. What are the economical benefits of investing in a plant? Agriculture traditionally provides corn, meat and milk. In the last 100 years, Denmark has been a frontrunner, when it comes to delivering those products with high quality, as well as being produced in an environmentally sound way. The globalization has however made Denmark more dependent of the world market and must adapt to these prices. This is a challenge for most farms. With a biogas plant, an already existing resource (manure) any 2 generation crop such as straw, cover crops, beet tops etc. and energy crops produced on the field is used. This means the farm gets a wider agricultural foundation as it now provides corn, meat, milk and energy. Most countries at this moment substitute production of green energy. There is a long-lasting guarantee on the price. In Denmark, the current settlement is set for year 2020 and we expect this settlement to be prolonged after year 2020. 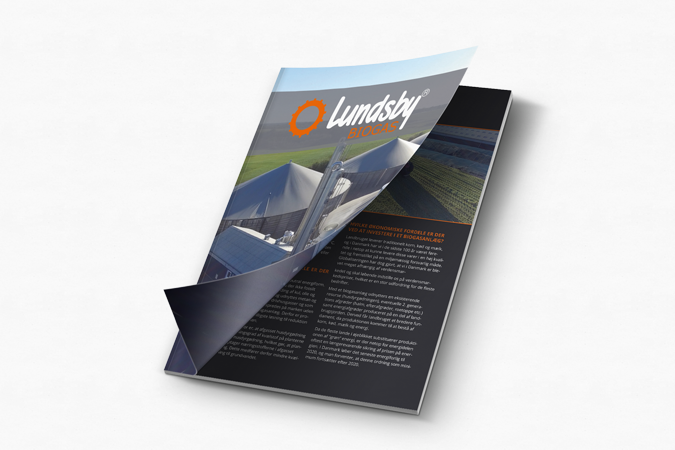 You are welcome to download our brochure as a pdf, and get to know more about the process with a plant. Also you can learn more about our references.